ACCORDING to one of the many Christmas carols blasted out at Stark’s Park yesterday, this is the most wonderful time of the year. Hibs would not disagree after goals by Jason Cummings, Liam Fontaine and Dominique Malonga ensured that they could celebrate their first back-to-back league victories of 2014. It is an embarrassing statistic for the Edinburgh side but, after a 2-0 win over, Alloa and this hard-earned triumph against Raith Rovers, the hope must be that their form is here to stay. Too often recently, it has come and gone like the trains that whizz by Raith Rovers’ ground. McKay, the winger on loan from Rangers – they hit back immediately and, despite labouring through much of the second half, had two late goals to thank for their victory. The three points lift them to third in the Championship, with Rangers next on the schedule. Alan Stubbs, the Hibs manager, praised his players for showing character when it was needed most. “In the first half, when we were creating opportunities, you’d like to see us take them, but the most important thing is that we were getting in the right positions,” he said. “I always felt like we would score. It was just a matter of time. In an open first half, Hibs were comfortably the better side, slinging the ball about nicely, picking holes in their opponents’ back four with intelligent through balls and needing only composure to take advantage. Malonga was one of the culprits, three times shooting straight at the goalkeeper, most notably when Scott Allan’s disguised pass set him up. “You are f***ing rubbish,” screamed a local worthy, whose industrial vocabulary echoed round the old corner stand all afternoon. “Language,” yelled another in protest. To be fair on Malonga, he was not the only wasteful one in Hibs’ ranks. David Gray, struggling with a groin problem that will soon require an operation, stubbed his toe at the back post. Then Liam Craig’s dink slipped by the upright, a lapse that was punished when Rovers took a surprise lead. Christian Nade’s long ball released McKay, who veered in from the right and into the box, where he poked the ball between the goalkeeper and his left-hand post. To their credit, Hibs refused to accept their lot as the interval drew near. They were up and at Raith, this time with an end product. When Malonga’s angled shot was cleared off the line, Cummings was on hand to turn it over the line. The game had been pleasing on the eye, certainly more so than David Sinclair gave it credit for. In an excruciating spot of half-time “entertainment”, the former Raith defender, who had clearly been enjoying the club’s hospitality, slipped into the vernacular of the old stand. 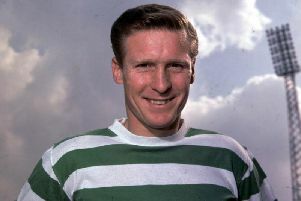 Asked if the game reminded him of past tussles with Hibs, he replied: “Nah, we played against men.” Football isnae like it used to be, he said, with a few expletives thrown in for good measure. Do not expect Sinclair to head up Rovers’ marketing department any time soon. Perhaps in his honour, Rovers adopted a higher-tempo, more physical approach early in the second half. And, for a while, it unsettled their opponents. Jason Thomson epitomised it by beating his man and bludgeoning a shot that was beaten away by the goalkeeper. Then Nade blasted wastefully over. This time, though, it was Hibs who would score out of nothing. Since the break, they had managed only a Danny Handling header, on to the roof of the net, but with 13 minutes left, they came good. A short corner was worked to Allan, whose cross was headed in by Fontaine. Raith: McGurn; Thomson, Watson, Hill, McKeown; McKay, Callachan, Scott, Conroy(Anderson 81); Nade (Elliot 89), Stewart. Subs not used: Vaughan, Ellis, Matthews, Barr, Laidlaw. Hibs: Oxley; Gray (Booth 70), Hanlon, Fontaine, Stevenson; Handling (Stanton 67), Allan, Robertson, Craig; Malonga (Heffernan 89), Cummings. Subs not used: Harris, Sinclair, Kennedy, Perntreau.